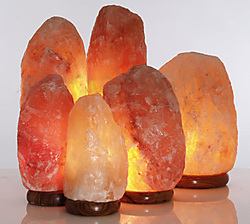 As well as being beautiful, salt lamps release negatively charged ions. These negative ions neutralize positively charged ions given out by computers, televisions, power grids etc. Negatively charged ions create an environment that is similar to being near the sea or a waterfall and are what give the air in these areas that fresh feeling. The salt lamps should be lit at all times as they give off more negative ions that way. Air quality is extremely important to our health and happiness. Some call negative ions "The Vitamins of the Air". By using Salt Crystal lamps, we can easily improve our environment, not only thorough the ionizing effects of the lamp but through the beautiful light they cast in a room! It is highly recommended to use them near a TV or computer, in a designated smoking room and an air-conditioned room. Modern life is stressful on the body. Just as more and more people are investigating the quality of the water and food we ingest, the quality of the air we breathe is extremely important to health and wellness. It is said we breathe in over 80 kilos of air each day. That is the equivalent of an Olympic sized swimming pool! Where Do Salt Lamps Come From? Salt crystal lamps are made from salt crystal rocks. This salt crystal comes from the ancient seas and is now available in the foothills of the Himalayas in Pakistan. Salt crystals of this quality are rare. How Are Salt Lamps Made? Explosives and standard mining methods cannot be used when mining salt crystal rock; they must be hand crafted to retain their original structure. This means that every salt lamp is different in size, shape, colour and intensity. Each salt lamp is unique. Where Should I Put My Salt Lamp? Child's bedroom - it also acts as a great nightlight! Basically, anywhere you want cleaner, fresher smelling air! How Are Salt Lamps Used? Why Are The Colours Different? The variety of colour in the Salt Lamps is because of iron and copper in the salt. These naturally occurring elements can produce colours ranging from yellow to peach to orange to red. You can also achieve certain colours using tinted light bulbs. What special care does my Salt Lamp need? The salt lamp will absorb humidity and may deposit salt if they are not properly cared for. So keep your lamp turned on as much as possible to release any excess moisture. Cover your lamp with a plastic bag if you will not be using it. Salt lamps are not designed to be used outside - they are meant for indoor use only. All models are CSA approved.